Scan QR code above to browse JBALB website via mobile. Note: The links above may not work for access from outside Sarawaknet intranet system. Jabatan Bekalan Air Luar Bandar (JBALB) Sarawak? d/a JKR Lawas OfficeJalan Hospital, 98850, Lawas. JBALB/LBG/QN/04/2019 Term Contract For The General Cleaning And Cleanliness Maintainance of The Building, Drain, Plants, switchboards, Compound and Maintainanceof Flowers For JBALB office and Gelugus Headworks. While best effort is made by JBALB to ensure content is up-to-date and old contents removed, visitors should always pay attention on the closing date of tenders listed herewith. The following tender is to be submitted to the Chairman, State Central Tenders Board, c/o State Financial Secretary’s Office, 14th Floor, Wisma Bapa Malaysia Petra Jaya, 93502 Kuching, Sarawak not later than 12:00 noon on the Closing date as specified below. Tender documents may be obtained from JBALB Contract Branch, Jabatan Bekalan Air Luar Bandar, Level One, ST3 Shopping Mall, Lot 55, Jalan Simpang Tiga, 93350 Kuching, Sarawak on payment of the specified document fee. The following tender is to be submitted to the Chairman, State Divisional Tenders Board Sri Aman, c/o Resident Office Sri Aman, Astana Road, 95000 Sri Aman, Sarawak not later than 12:00 noon on the closing date as specified below. Tender Documents may be obtained from JBALB Contract Section, Bahagian Sri Aman, Jalan Hospital, 95008 Sri Aman, Sarawak on payment of the specified document fee and document deposit. The following Quotation was previously advertised on 13th April 2019 to be submitted to The Chairman, JBALB HQ Quotation Board, c/o Ibu Pejabat Jabatan Bekalan Air Luar Bandar (JBALB) Sarawak Mezzanine Floor, Bangunan ST3, No. 55, Jalan Simpang Tiga, 93350 Kuching, Sarawak. The following Quotation was previously advertised on 13th April 2019 to be submitted to State Divisional Tenders Board Sarikei, c/o Resident Office Sarikei, Level 9 & 10, Wisma Jubli Mutiara, Jalan Bersatu, 96100 Sarikei, Sarawak. 1. The Government does not bind itself to accept the lowest or any tender. 2. Only submissions signed by person(s) duly authorised by the tendering firm(s) or company(ies) shall be considered. 3. Original copy(ies) of Proof of Registration with CIDB/UPKJ/PKK/FFO as may be relevant must be produced before document(s) may be obtained. Tenderers for Work Project are reminded to present their Registration Status with CIDB. 4. The UPKJ registration must be valid not less than three (3) months from the expiry date. In case of renewal, Tenderer to show proof of renewal. The following quotation is to be submitted to the The Chairman, JBALB HQ Quotation Board, c/o Ibu Pejabat Jabatan Bekalan Air Luar Bandar (JBALB) Sarawak Mezzanine Floor, Bangunan ST3, No. 55, Jalan Simpang Tiga, 93350 Kuching, Sarawak. not later than 12:00 noon on the Closing date as specified below. Quotation documents may be obtained from JBALB Contract Branch, Jabatan Bekalan Air Luar Bandar, Level One, ST3 Shopping Mall, Lot 55, Jalan Simpang Tiga, 93350 Kuching, Sarawak on payment of the specified document fee. The following tender is to be submitted to the Chairman, State Divisional Tenders Board Sarikei, c/o Resident Office Sarikei, Level 9 & 10, Wisma Jubli Mutiara, Jalan Bersatu, 96100 Sarikei, Sarawak not later than 12:00 noon on the Closing date as specified below. Tender documents may be obtained from JBALB Contract Section, Bahagian Sarikei, Tingkat 2, Meranti Office, 96100 Sarikei, Sarawak on payment of the specified document fee and document deposit. The following tender was previously advertised on 6th April 2019 to be submitted to State Divisional Tenders Board Sarikei, c/o Resident Office Sarikei, Level 9 & 10, Wisma Jubli Mutiara, Jalan Bersatu, 96100 Sarikei, Sarawak. The following tender was previously advertised on 19th January 2019 to be submitted to Chairman, State Central Tenders Board, c/o State Financial Secretary Office, 14th Floor, Wisma Bapa Malysia Petra Jaya, 93502 Kuching, Sarawak and closed on 13th February 2019. This notice is to serve as the tender below is CANCELLED. The following tender is to be submitted to the Chairman, State Central Tenders Board, c/o State Financial Secretary’s Office, 14th Floor, Wisma Bapa Malaysia Petra Jaya, 93502 Kuching, Sarawak not later than 12:00 noon on the Closing date as specified below. Tender documents may be obtained from JBALB Contract Section, Jabatan Bekalan Air Luar Bandar, Level One, ST3 Shopping Mall, Lot 55, Jalan Simpang Tiga, 93350 Kuching, Sarawak on payment of the specified document fee. The following tender is to be submitted to the Chairman, State Divisional Tenders Board Samarahan, c/o Resident Office Samarahan, Tingkat 1, Kompleks Pentadbiran, Jalan Datuk Mohd Musa, 94300 Kota Samarahan, Sarawak not later than 12:00 noon on the Closing date as specified below. Tender documents may be obtained from JBALB Contract Section, Bahagian Samarahan, Jalan Datuk Mohd Musa, 94300 Kota Samarahan, Sarawak on payment of the specified document fee. The following tender is to be submitted to the Chairman, State Divisional Tenders Board, Kuching, c/o Resident Office Kuching, Level 7, Komplek Islam Sarawak (Majma’ Tuanku Abdul Halim Mu’adzam Shah), Lorong P. Ramlee 5, Off Jalan P. Ramlee, 93400 Kuching, Sarawak not later than 12:00 noon on the Closing date as specified below. Tender documents may be obtained from JBALB Contract Branch, Bahagian Kuching, Jalan Batu Lintang, 93200 Kuching, Sarawak on payment of the specified document fee and document deposit. The following tender is to be submitted to the Chairman, State Divisional Tenders Board, Miri, c/o Resident Office Miri, Kingsway Road, 98000 Miri, Sarawak not later than 12:00 noon on the Closing date as specified below. Tender documents may be obtained from JBALB Contract Branch, Bahagian Miri, Tingkat 1 and 2, Wisma Pelita Tunku Miri, Jalan Padang, 98000 Miri, Sarawak on payment of the specified document fee and document deposit. Proposed Improvement Works of Existing Water Reticulation System at Kapit Town and Adjacent Area, Kapit Division, Sarwak. The following tender is to be submitted to the Chairman, State Divisional Tenders Board Kapit, c/o Resident Office Kapit, Level 8 & 9, State Government Complex, Bleteh Road, 96800 Kapit, Sarawak not later than 12:00 noon on the Closing date as specified below. Tender documents may be obtained from JBALB Contract Section, Bahagian Kapit, Aras 6 & 7, Kompleks Kerajaan Negeri Kapit, Jalan Beleteh, 98700 Kapit, Sarawak on payment of the specified document fee. The following tender is to be submitted to the Chairman, State Divisional Tenders Board, Limbang, c/o Resident Office Limbang, Level 6, Limbang Plaza, 98700 Limbang, Sarawak not later than 12:00 noon on the Closing date as specified below. Tender documents may be obtained from JBALB Contract Section, Bahagian Limbang, d/a JKR Lawas, Jalan Hospital, 98850 Lawas, Sarawak on payment of the specified document fee and document deposit. The following tender is to be submitted to the Chairman, State Divisional Tenders Board Kapit, c/o Resident Office Kapit, Level 8 & 9, State Government Complex, Bleteh Road, 96800 Kapit, Sarawak not later than 12:00 noon on the Closing date as specified below. Tender documents may be obtained from JBALB Contract Section, Bahagian Kapit, Aras 6 & 7, Kompleks Kerajaan Negeri Kapit, Jalan Beleteh, 98700 Kapit, Sarawak on payment of the specified document fee and document deposit. 1. Tender documents for the above 4 tenders (T/JBALB/073 to T/JBALB/076/11/2016) can also be obtained from JBALB HQ Kuching and JBALB Sibu Offices. 3. However, all tenders must be submitted to Kapit Resident Office before the Closing Date. The following tender is to be submitted to the Chairman, State Divisional Tenders Board Betong, c/o Resident Office Betong, Aras 2-3, Menara Utama, Kompleks Pejabat Kerajaan Negeri, Kawasan Bandar Baru Betong, Jalan Setia Raja, 95700 Betong, Sarawak not later than 12:00 noon on the Closing date as specified below. Tender documents may be obtained from JBALB Contract Section, Bahagian Betong, Bangunan Depo Lama JKR, Jalan Utama Betong, 95700 Betong, Sarawak on payment of the specified document fee and document deposit. The following tender is to be submitted to the Chairman, State Central Tenders Board c/o State Financial Secretary’s Office, 14th Floor, Wisma Bapa Malaysia, Petra Jaya, 93502 Kuching, Sarawak not later than 12:00 noon on the Closing date as specified below. Tender documents may be obtained from JBALB Contract Branch, Jabatan Bekalan Air Luar Bandar, Level One, ST3 Shopping Mall, Lot 55, Jalan Simpang Tiga, 93350 Kuching, Sarawak on payment of the specified document fee and document deposit. The following tender is to be submitted to the Chairman, State Divisional Tenders Board Sarikei, c/o Resident Office Sarikei, Level 9 & 10 Wisma Jubli Mutiara, Jalan Bersatu, 96100 Sarikei, Sarawak not later than 12:00 noon on the Closing date as specified below. Tender documents may be obtained from JBALB Contract Branch, Bahagian Sarikei, Tingkat 2, Meranti Office, 96100 Sarikei, Sarawak on payment of the specified document fee and document deposit. 3. Original copy(ies) of Proof of Registration with CIDB/UPKJ/PKK/FFO as may be relevant must be produced before document(s) may be obtained. Work Contractors are reminded to present their Registration Status with CIDB. Clearing of Debris, Mud, Deposited Silt and Unwanted Materials at Raw Water Intake, Kaki Wong Water Treatment Plant (As On And When Required Basis) Saratok District, Betong Division. JBALB/BTU/Q/2019(4) Term Contract For The Transportation of Water From Various Water Treatment Plant Take Off Points to Various Location Within Tatau, Kuala Tatau, Bintulu / Tatau Road And Sangan Drought Area in Bintulu Division On "As And When Required Basis". JBALB/BTU/Q/2019(01) Term Contract for The Transportation of Water from Various Water Treatment Plant Take Off Points to Various Location Within Ulu Sebauh, Sebauh and Pandan Drought Area in Bintulu Division on "As and When Required Basis"
JBALAB/Q/2018(10) Term Contract For The Provision Of Suitable Four (4) Wheel Drive For Transport JBALB Staff Or Officer To Various Location In Bintulu Division For One (1) Year Period. JBALB/Q/2018(07) Proposed 160mm HDPE Submain Water Pipeline Extension And Communication Pipe To Rh. Nicholas Anak Changam, Ulu Sebauh Bintulu. UPKJ (Works) & CIDB (PPK), Bumiputera Status. CIDB (PPK) & CIDB (SPKK), Bumiputera Status. JBALB/Q/2018(06) Proposed 160mm HDPE Submain Water Pipeline Extension And Communication Pipe To Rh. Nyaing Anak Unol, Ulu Sebauh Bintulu. UPKJ (Works) & CIDB (PPK), Bumiputera Status. JBALB/Q/2017(07) 160MM HDPE SUB-WATERMAIN EXTENSION TO RH. SELANJAT, ULU SEBAUH BINTULU. TERM CONTRACT FOR THE SUPPLY OF LABOUR, TOOLS, EQUIPMENT TRANSPORT AND ETC. TO CARRY OUT CLEARING AND REMOVAL OF SETTLED SILT, MUD AND DEBRIS ETC. AT RAW WATER INTAKE, SEDIMENTATION TANK, FLOCCULATION TANK, FILTRATION TANK, HIGH LEVEL TANK AND CLEAR WATER WELL OF BAKUN WATER SUPPLY, SG.ASAP, BINTULU DIVISION FOR YEAR 2017/2018 AS WHEN AND REQUIRED BASIC. JBALB/Q/2017(02) Term Contract For The Provision Of Suitable Four (4) Wheel Drive For Transport JBALB Staff Or Officer To Various Location In Bintulu Division 2017. JBALB/SRK/Q/07/2016 Term Contract for Repair of Watermains and communication Pipe Within Julau District, Sarikei Division. For Year 2016-2017 Class F, Head I, Subhead 4 (a)/4(b)/4(c) AND Valid Certificate Company Registration With Construction Industry Development Boards (CIDB) 12 Months or up to maximum value of RM50,000.00 wherever come first. Proposed Water Main Extension To SK Melaban, Lubok Antu District. Proposed Water Main Extension To SK Nanga Kesit, Lubok Antu District. Contract Section, 2nd Floor, JBALB Office, Bahagian Sarikei. 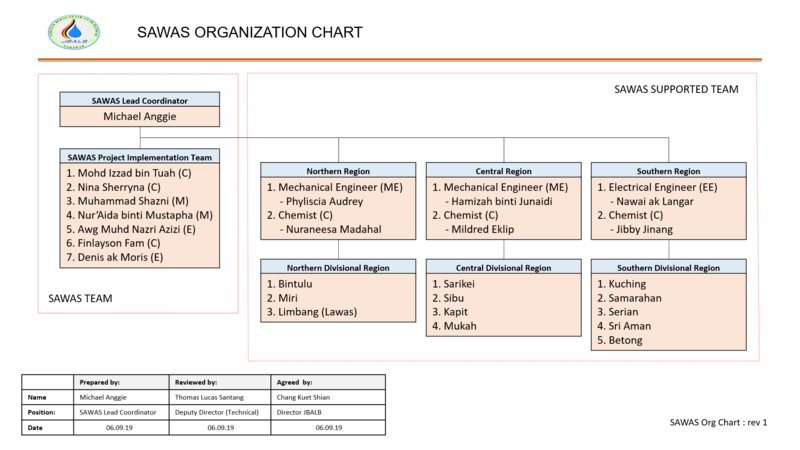 JBALB/SRK/Q/2/2019 TERM CONTRACT FOR ELECTRICAL MAINTENANCE, REPAIRS AND INSTALLATION OF ELECTRICAL APPLIANCES, ACCESSORIES AT JBALB WATER HEADWORKS AND BOOSTER STATIONS, SARIKEI DIVISION. JBALB/SRK/Q/5/2019 TERM CONTRACT FOR PREVENTIVE MAINTENANCE, SERVICING AND BREAKDOWN MAINTENANCE FOR PLANT AND EQUIPMENT AT JULAU, TEMADAK, PAKAN WATER TREATMENT PLANT INCLUDING TG. GENTING, KJD, BINTANGOR TOWN, SG. SIAN, BAKONG, PAKAN JUNCTION, WUAK, ENGKAMOP BOOSTER STATIONS, SARIKEI DIVISION. Term contract for maintenance of compounds and grasscutting work to beluru high level tank/booster sation,long lama,marudi(old) and bario water treatment plant compound,miri division. Subhead 2 3 Months 07.06.2018 21.06.2018 12.00 Noon Pejabat JBALB Bahagian Mukah, Tingkat 2, Pusat Pentadbiran Baru, Bangunan Score, Jalan Wawasan, 96400 Mukah, Sarawak. Proposed Replacement of Pump Set, Generator Set and M&E Related Equipment At Various Water Treatment Plant, Booster Station and Raw Water Intake For Mukah Division. Two (2) Years Term Contract For Installation Of New Bulk Meter On “ As Required Basis” In Mukah District, Balingian & Kuala Balingian Sub-District, Igan Sub-District & Dalat Sub District ( Dalat, Kut, Oya ) Mukah Division. One (1) Year Term Contract For The Delivery Of Potable Water From Nearest Water Treatment Plant To Destinated Location, Mukah District. One (1) Year Term Contract For The maintenance and Clearance Of The Compounds, Road Verges And Concrete/Earth Drain For Dalat District (Dalat, Oya & Sg.Kut) Water supply at Mukah Division. Two (2) Year Term Contract For Handling, Transportation And/Or Shipment Of Chemicals, Pipes And Pipe Fittings etc. From JKR Sibu To Various Water Treatment Plant Chemical Store And Depot For Dalat District (Dalat, Oya & Sg.Kut) At Mukah Division. Requote : Two Years Term Contract For The Search & Repair/Renewal Of Various Types Sizes Of Pipes And Appurtenances Leaking For Watermain In Mukah Water Supply Limit Area. Turut bersama hadir dalam lawatan tersebut adalah Puan Chhoa Jurutera Air Bahagian Kuching dan Encik Awang Mohd Hafizie, Penolong Jurutera JBALB Lundu/Sematan. JBALB Sarawak mengadakan 'Pre-Lab HPT Solutions on Water Supply' bertempat di Hotel Citadines, Kuching bermula 5hb - 6hb April 2019. Bengkel ini dihadiri oleh Tuan Pengarah, Ir Chang Kuet Shian dan Pengurusan Tertinggi JBALB Sarawak. Turut bersama-sama menghadiri bengkel ini adalah wakil dari SHRU dan Kementerian Utiliti Sarawak. The core business of JBALB Sarawak as reflected in its mission is to ensure the provision of potable and safe water supply to the required standard and quality and which are adequate, affordable and reliable and able to meet the needs of all users. Development of a skilled, competent and motivated workforce for operation and maintenance of the water supply systems. Assisting the State Water Authority in the administration and enforcement of the Water Ordinance, the Water Supply Regulations and related licensing provisions in the State. JBALB stands for Jabatan Bekalan Air Luar Bandar. Since 1882, Jabatan Kerja Raya (JKR) Sarawak has been entrusted with the responsibility of constructing and maintaining public infrastructure, buildings, including water supply system for the Government. This role has to be realigned, strengthened and enhanced to keep pace with the changes in the operating environment due to population growth and the socio-economic development agenda in the State towards achieving Vision 2020. The management and administration of public water supplies in Sarawak is under the purview of Ministry of Public Utilities. The Permanent Secretary of the Ministry of Public Utilities is appointed as the State Water Authority (SWA) under the provisions of the Water Ordinance 1994 which has also allowed for the establishment of various Water Supply Authorities under Jabatan Kerja Raya (JKR) to supply potable water to stipulated towns and rural areas. Jabatan Bekalan Air Luar Bandar (JBALB), formerly JKR Water Supply Authorities, was launched in 1st September 2015. The appointment of its first director, Ir. Daniel Wong Park Ing was on the 1st OCtober 2015. It has now then carried on with the same roles and responsibilities as JKR Water Supply Authorities. 100% Water Supply Coverage for Rural Sarawak by 2025. To Provide Safe Reliable Water Supply in Rural Sarawak. Or, you may pay your bills at any SBBS counters or Post Office statewide.